The Mumbai judge mentioned use of Sadhvi Pragya Singh Thakur's motorcycle in Malegaon blast, said accused wanted to 'create Hindu Rashtra'. 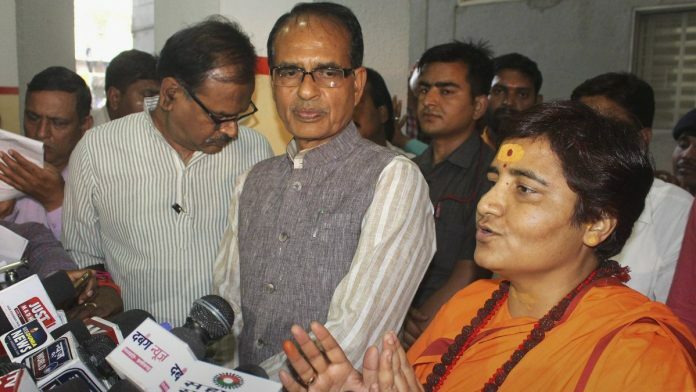 New Delhi: Sadhvi Pragya Singh Thakur, an accused in the 2008 Malegaon blast case, was Wednesday fielded by the BJP from the Bhopal seat for the Lok Sabha elections. She will be contesting against Congress veteran and former Madhya Pradesh chief minister Digvijaya Singh. Although Thakur was given a clean chit in the case by the National Investigation Agency (NIA) in 2016, the following year a Mumbai trial court framed charges against her. In his December 2017 order, the Mumbai judge had noted that there was sufficient material to frame charges against Thakur. There “is prima facie case regarding conspiracy against accused No1. (Pragya)… to commit bomb blast at Malegaon”, special judge (NIA and MCOCA) S.D. Tekale had noted. The 2008 Malegaon blast took place outside a mosque on 29 September, killing six people and injuring several others. The court charged Thakur and seven others under sections of the Unlawful Activities (Prevention) Act (UAPA), which deal with conspiracy to commit, advocate, incite or knowingly facilitate a terrorist act. The court also charged Thakur for criminal conspiracy under the Explosive Substances Act. It, however, dropped charges under the more stringent Maharashtra Control of Organised Crime Act (MCOCA), and discharged the accused from sections of the UAPA that directly relate to raising funds for terrorist acts, being members of a terrorist organisation, as well as sections of the Arms Act. “Cumulative effect of all incriminating circumstances clearly show the strong suspicion against above accused persons i.e. accused No.1 (Pragya), 4, 5, 6, 9, 10 and 11 about their involvement in commission of crime i.e. bomb¬blast at Malegaon,” the court had noted. Judge Tekale acknowledged there is “no direct evidence regarding discussion of causing bomb blast at Malegaon amongst the accused persons except in Bhopal meeting”. But the court also noted that witnesses had retracted statements in which they said there was a discussion on carrying out a bomb blast at Malegaon in the Bhopal meeting. However, relying on the top court judgment in the case involving Nalini — she was convicted of assassinating Rajiv Gandhi — the judge said that “conspiracy generally is hatched in private or in secrecy”. The court also noted that Navratri was set to commence around the time of the blast and hence the “place and time” was chosen to ensure that the blasts “threaten the unity of people by striking terror in particular section of the people”. The court also countered Thakur’s defence that she may have said things in the heat of the moment by submitting that the “tone of discussion” proved that the accused “were advocating certain ideology and according to them, one of the ways to implement the said ideology is to create threat against Muslim and Christian”. The judge took into account the discussion at a meeting by the accused in which Sadhvi Pragya was not present, at Anangpur in Faridabad, which showed their “mindset”. “Tone of the discussion shows that they want to create Hindu Rashtra excluding the Muslims and Christians. In the said meeting view was expressed to create threat against Muslims and Christians by striking them,” the judge said. Also read: Can India be a Hindu Rashtra—and Hindus a minority—at the same time? The court also noted that at the meeting in Bhopal, in which Thakur was present, the accused discussed about “jihadi activities in Aurangabad and Malegaon”, and one of the accused (accused no. 9) sought to prevent it by expanding the “Abhinav Bharat Sanghatan in the said area”. The charges against Pragya were fabricated and false. Her motorbike was used to frame he by the highest authority and supported by the home minister Shinde, Chittambaram and Digvijay. But congress government failed to provide any proof or evidence against her for consecutive seven years and brutally handled her in prison even medicine not provided. One cannot judge the lady’s guilt or innocence. However, it will be difficult now to raise terrorism as a major concern in global fora. Just as the Samjhauta Express acquittals have sealed the fate of the 26 / 11 trial in Pakistan.